This study assesses the threat that depletion poses to the availability of petroleum resources. It does so by estimating cumulative availability curves for conventional petroleum (oil, gas, and natural gas liquids) and for three unconventional sources of liquids (heavy oil, oil sands, and oil shale). The analysis extends the important study conducted by the U.S. Geological Survey (2000) on this topic by taking account of (1) conventional petroleum resources from provinces not assessed by the Survey or other organizations, (2) future reserve growth, (3) unconventional sources of liquids, and (4) production costs. The results indicate that large quantities of conventional and unconventional petroleum resources are available and can be produced at costs substantially below current market prices of around US$120 per barrel. These findings suggest that petroleum resources are likely to last far longer than many are now predicting and that depletion need not drive market prices above the relatively high levels prevailing over the past several years. 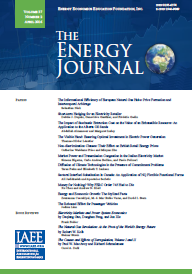 Published in Volume 30, Number 1 of The Quarterly Journal of the IAEE's Energy Economics Education Foundation.